You know, when you walk into a murky river you could step on anything. I’ve never understood how easily some people will just leap on in when they can’t see a thing. I suppose it’s like life; maybe I could do with just stepping in more an looking less. Sandy’s a funny kid. I say kid, but he’s not much younger than me. He’s fifteen. I’m eighteen. It’s only three years but sometimes it seems like thirty. Dad said I burst into the world, born effortlessly on the way to the hospital, which for a first baby was something. I screamed my lungs out and the doc told Mum she was a natural. Sandy though was way too early. Born premmie, he had to spend his first few months in hospital. Probably daydreaming in the womb and before he knew it he’d just drifted out. Typical. Sandy causing a lot of drama for everyone. They had to get the flying doctors out and all sorts. On a farm in the Mallee, Sandy and Red and their dad are adjusting to life following the death of their mother. Sandy is no natural farm boy, scared of goats and allergic to spring. He keeps his secrets tight. Red loves the farm but is so angry with the world that he may as well be a willy-willy – wild and out of control. Their dad is just trying to keep it together. Three of them, no talking, in a brutal landscape of wind and searing heat. It’s going to be a big year. 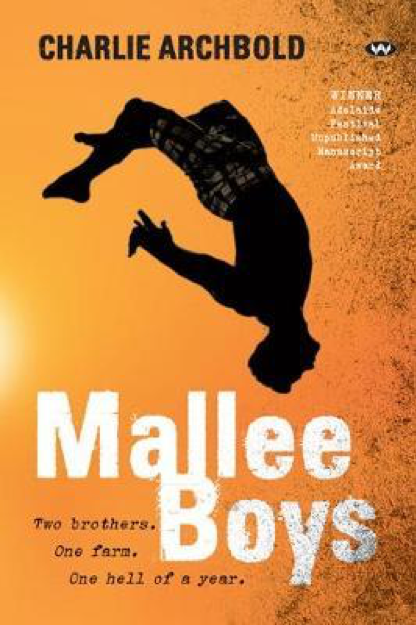 ‘Mallee Boys’ is a wrenching, real story about grief and survival. It’s also about choosing your path, even if it’s not easy and might take you away from everything you know. The landscape is tough, but full of beauty for those who look for it. Plenty of themes in here: loss, responsibility, change, family, truth, communication. Without their mum to guide them, and with their dad drowning in his own loss, two young men have to make their own decisions and live with them. Recommended for mid- upper-secondary readers.